Examples of gardens maintained and work done by Eco Garden Maintenance in the Leeds, York, Selby, Wetherby and Tadcaster areas. This large country garden is maintained solely by Eco Garden Maintenance. 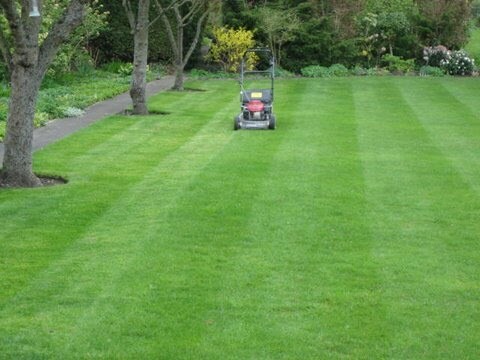 Pictured here is a Honda Pro roller mower which produces these lovely, long lasting stripes which are highly attractive. Our lawn care services contribute considerably to the quality of this lawn. As well as extensive lawn areas this garden has numerous large trees, shrubs, hedges and ornamental borders. A very long hawthorn hedge is being trimmed by Stuart Brogden from Eco Garden Maintenance, using the Pellenc battery powered hedge trimmer. 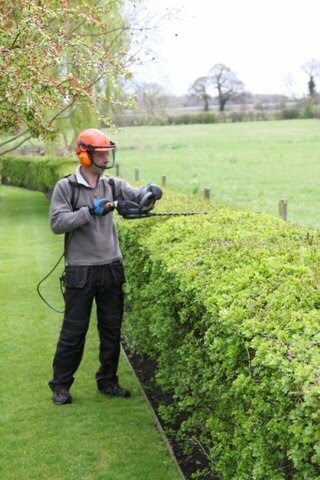 This particular hedge gets trimmed two, or sometimes three times per growing season. Notice the "A" shape of the hedge which apart from looking extremely attractive, lets light to the lower section of the hedge for better leaf coverage. The grass to either side of the hedge is contained neatly with wooden edging strips. The area under the hedge is kept free of weeds and mulched once per year with organic matter which reduces competition for the hawthorn plants and provides nutrients and soil conditioner. Any dead wood is removed regularly and new stems are trained into the vacated spaces to provide complete cover from top to bottom. Courtyards, patio's and other paved areas can become unattractive places, often covered in leaves, other debris and moss. 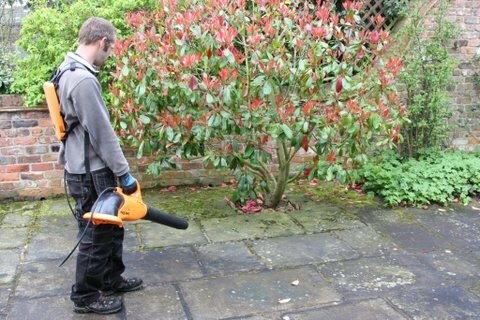 Here we see the Pellenc battery powered blower used by Eco Garden Maintenance to clear leaves and other loose debris. Plants situated in soil surrounded by paving (such as this Photinia) are often neglected, but should be watered and fed with liquid fertiliser regularly. A long, ornamental border just starting to show growth in early April. The pleached Hornbeam hedge runs the full length of this border and provides privacy by producing its growth above the top of the rustic brick wall. There is some evergreen structure to this border, which gives some interest even in the middle of winter. By mid summer the border will be awash with colour, texture and varying height. A row of three Magnolia Grandiflora divided by two standard Holly planted in large pots and clipped in to balls. 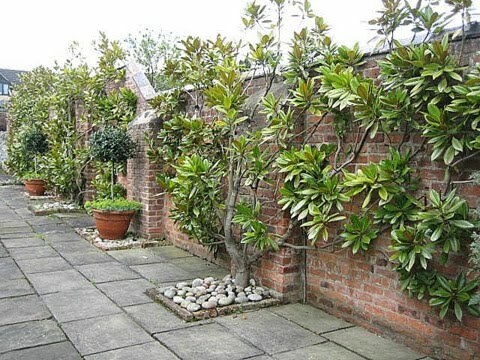 The magnolia are wall trained in a fan shape to cover as much wall as possible and to get the maximum amount of visible foliage and flower. These are pruned and trained every year and receive liquid fertiliser in the form of foliar and soil applications. It is very important that large shrubs such as these are fed regularly especially when the roots are restricted by paving.